By the end of this year, the Mercedes-Benz Sprinter will be the second-oldest nameplate in its segment here in the States, but with hot new competition waiting in the wings, Mercedes-Benz is giving its hauler a freshened look and more equipment to stave off rivals. The Sprinter was a pioneer in bringing Euro-style delivery vans to North America, and it’s inspired others to transplant their Continental offerings, with the all-new Ford Transit and Ram Promaster models launching shortly. It will also continue to do battle with lower-cost traditional competitors like the Chevrolet Express and Ford E-Series. The big Sprinter will thus get a new look to go with more safety features and available technology. 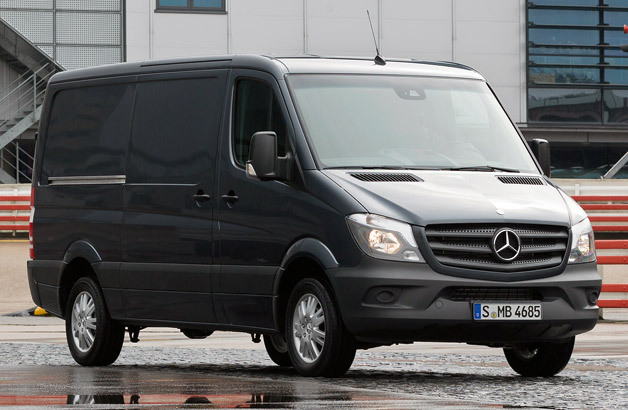 While the information released here technically covers the Euro-spec 2013 Sprinter (which goes on sale in September), the US market is expected to get the new Sprinter for the 2014 model year with many of the same features. Some of this new technology includes a Crosswind Assist feature as standard equipment and the availability of Collision Prevention Assist and Blind Spot Assist as optional safety measures – Mercedes-Benz says that all three are firsts for any van in the world. Also added to the updated Sprinter is a new 1.8-liter supercharged gasoline (or CNG) engine producing 156 horsepower, which will complement the line of diesel engines that carry over and help make the Sprinter the first cargo van to meet the upcoming Euro VI emissions standards. Buyers will get to choose between a six-speed manual or a seven-speed automatic, which ought to further aid fuel economy. Additionally, a lower ride height is said to improve fuel economy and should improve handling while aiding ingress and egress for both people and cargo. In terms of styling, the Sprinter’s new face also looks more like the current line of Mercedes-Benz passenger cars. This includes a more upright grille along with changes to the hood, headlights and bumper that lend it a closer kinship to models like the CLS-Class and the updated E-Class. The Sprinter will offer both halogen and HID headlights, while the latter will get LED running lamps and offer Highbeam Assist. The images shown here only reveal the exterior from front angles, but it looks like few, if any, changes have been made to the rear of the van. Interior upgrades include a thicker steering wheel, a new shift lever and the latest in audio, navigation and entertainment systems. Scroll down for the official press release for the new Mercedes-Benz Sprinter. Mercedes Sprinter updated to take on Ford Transit, Ram ProMaster originally appeared on Autoblog on Mon, 29 Apr 2013 11:00:00 EST. Please see our terms for use of feeds. This entry was posted on Thursday, June 27th, 2013 at 10:19 pm and is filed under Mini Bus Hire. You can follow any responses to this entry through the RSS 2.0 feed. Responses are currently closed, but you can trackback from your own site.